« "Holocaust survivors reunite with vet"
"Soldiers reunite with Nazi death train survivors"
The audience stood, applauded and cheered after five men shook hands, smiled and faced the packed crowd. What the audience witnessed was history — an unexpected chapter to an extraordinary tale that began 62 years ago in Germany, at the end of World War II, and continued Friday at Hudson Falls High School. The experience was overwhelming for Carrol Walsh, who was among the five men on stage. After all, it made him recall the events of April 13, 1945, when he and his tank battalion investigated a train that German troops had abandoned near Magdeburg, Germany. The battalion discovered 2,500 Jews crammed in boxcars en route to a death camp. The Jewish families had been held captive for two years, during which they survived the infamous concentration camp at Bergen-Belsen and were forced to live with little food in unsanitary conditions under German military watch. But on that fateful, April day, they were liberated, thanks to Walsh, his buddy, Sgt. George Gross, and others in the battalion, which included two tanks. If not for their help, Fred Spiegel, Micha Tomkiewicz and Peter Lantos may not have survived to see the end of the war, let alone the emotional connections made during Friday’s event. “I feel very emotional about the meeting and the get-together, never having ever to imagine that I would meet anyone who was on that train,” said Walsh after the morning program. He is now a retired judge who moved to Hudson Falls in July after living in Johnstown. “To see these people in the flesh is simply an overwhelming, emotional experience,” he said. Tomkiewicz, who is now the director of environmental studies at the Brooklyn College of the City University of New York, could only remember pieces of his liberation because he was a child at the time. Therefore, he and other survivors started searching for more details to fill in the blanks. But the information he obtained left him with a broad and abstract image of the past — until Friday. The fifth man on stage was Matthew Rozell, not a passenger on the train, but rather a Hudson Falls High School history teacher who created a World War II history project in the 1980s to generate student interest in that war. The project has since evolved into a detailed Web site that chronicles war stories from local military veterans. One of his students was Walsh’s grandson, which is what led Rozell to interview Walsh in 2001. During the interview, Walsh’s daughter suggested he tell Rozell about the train. Afterward, Walsh put Rozell in contact with Gross, who lived in California. Gross provided photos and narratives of the liberation for Rozell to post on the project Web site. Four years later, Rozell received an e-mail from Lexie Keston, a Holocaust survivor who was on the same train. She was 6 at the time. 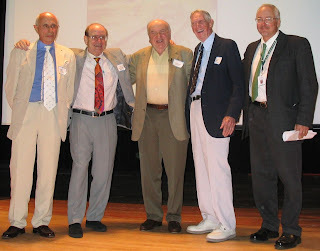 The Web site, located at http://www.hfcsd.org/ww2, also led Tomkiewicz, Spiegel and Lantos to Rozell, and ultimately spawned Friday’s reunion. Lantos, an emeritus professor of neuropathology at the University of London, traveled from England to attend Friday’s event, while Spiegel, an author and lecturer, came from New Jersey. The two-part reunion included speeches from the three survivors. Spiegel and Lantos each spoke about the books they wrote on their Holocaust experiences. Dr. Gross, an emeritus professor of English who lives in San Diego, was unable to attend the reunion because of health reasons. He did, though, provide a letter that was read to the gathering by English teacher Rene Roberge. The reunion was recorded, and a copy of the recording will be sent to Gross. Ms. Keston, who lives in Sydney, Australia, also was unable to attend, but she also wrote a letter that was read aloud by history teacher Mrs. Tara Sano at the gathering. “I found the experience so raw and emotional that I screamed and burst into tears,” she wrote of her reaction on finding the liberation photos on Rozell’s Web site. The morning program included the showing of “A Train Near Magdeburg,” a DVD by seniors Troy Belden and Eric Roman, that included the photos and narratives by the liberators of the train scene. The dozen photos showed families leaving the train and some children smiling at the camera despite being weakened from starvation. The project really had an impact on the students who worked in it. “Meeting these people that came from the worst of the worst, and they just have the most positive attitude about it,” said Hudson Falls senior Troy Belden. Later on, Lantos and Spiegel sold copies of their books outside the auditorium. Hudson Falls senior Adam Armstrong, who bought a book, was surprised his school could play a role in Holocaust history. “I still can’t believe that our school — that not a lot of people will know about because we are a small town — can do this much for history itself, that we can be history in the making,” Armstrong said. Those involved in the event said the chance meeting has changed them as well. “Sixty-two years ago, as those events happened, I never in my wildest imagination thought I would ever meet anyone from that train again,” said Walsh. Though the photos and narratives have been on the Web for four years, more people have been viewing them recently, Rozell said. 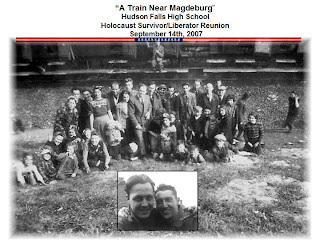 He expects more soldiers and survivors will come forward with their own stories of the Magdeburg train as the reunion gains publicity, he said. Tomkiewicz said he is trying to convince the education department at his school to invite Rozell for a presentation. Thanks to Omar Aquije and the Glens Falls Post-Star for permission to use this story, as well as Albany, NY’s Capital News 9’s Kaitlyn Ross for filling in some detail.